Bermuda (officially, The Bermuda Islands) is a British overseas territory in the North Atlantic Ocean. Located off the east coast of the United States, it is situated around 1,100 miles (1,770 km) northeast of Miami, Florida. The nearest landmass is Cape Hatteras, North Carolina, about 640 miles (1,030 km) west-northwest. It is the oldest remaining British overseas territory, settled by England a century before the Acts of Union that created the United Kingdom of Great Britain. Although commonly referred to in the singular, the territory consists of approximately 138 islands, with a total area of 20.6 sq. mi. (53.3 km²). Compiling a list of these islands is often complicated, as many have more than one name (as does the entire archipelago, which, in addition to its two official names, has historically been known as "La Garza," "Virgineola," and the "Isle of Devils"). 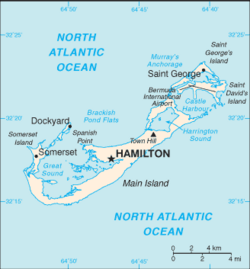 Despite the limited landmass, there has also been a tendency for place names to be repeated; there are, for instance, two islands named "Long Island," three bays known as "Long Bay" and the town of St. George is located within the parish of Saint George on the island of Saint George, whereas Bermuda's capital, the City of Hamilton, lies in Pembroke Parish, not Hamilton Parish, on the largest island, "Main Island," which itself is sometimes called "Bermuda" (or "Great Bermuda"). As a leading offshore financial center, Bermuda has a thriving economy, with a large financial sector and tourism industry, giving it the world's highest GDP per capita in 2005. It has a sub-tropical climate, pink beaches, and cerulean blue ocean waters. Bermuda is located in the North Atlantic Ocean, roughly 580 nautical miles (1,070 km, 670 miles) east-southeast of Cape Hatteras on the Outer Banks of North Carolina and roughly 590 nautical miles (1,100 km, 690 mi) southeast of Martha's Vineyard. It has 64 miles (103 km) of coastline. There are two incorporated municipalities in Bermuda: the City of Hamilton and the Town of Saint George. Bermuda is divided into various "Parishes," in which there are some localities called "villages," such as Flatts Village, Tucker's Town, and Somerset Village. Aerial view of Bermuda looking west, with Saint David's and Saint Georges in the foreground. Image courtesy of Bermuda Ministry of Tourism & Transport. 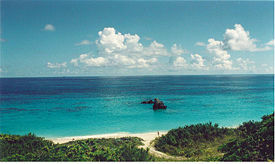 Although Bermuda's latitude is similar to that of Savannah, Georgia, the subtropical climate of Bermuda is warmed by the nearby Gulf Stream. The climate is humid and, as a result, the summertime heat index can be high, even though mid-August temperatures rarely exceed 30°C (86°F). Winters are mild, with average daytime temperatures in January and February around 20°C (68°F), although the occasional Atlantic winter storms can produce powerful winds and heavy rain, with the "apparent air temperature" feeling like 5°C (40°F), even though the actual temperature rarely drops below 10°C (50°F). The only source of fresh water in Bermuda is rainfall, which is collected on roofs and catchments (or drawn from underground lenses) and stored in tanks. Each dwelling usually has at least one of these tanks forming part of its foundation. Bermuda cedar on the outskirts of Hamilton. The flora and fauna of Bermuda forms part of a unique ecosystem thanks to Bermuda's isolation from the mainland of North America. There are a wide range of endemic species, and the islands form a distinct ecoregion. Bermuda's wildlife is limited to those species that were able to fly to the island or were carried by winds and currents. This has resulted in some groups such as mammals being poorly represented. Once on the island, organisms had to adapt to local conditions such as the climate, lack of fresh water, frequent storms, and salt spray. The islands shrank as water levels rose at the end of the Pleistocene epoch, and fewer species were able to survive in the reduced land area. Today the variety of species on Bermuda has been greatly increased by introductions, both deliberate and accidental. Many of these introduced species now pose a threat to the native flora and fauna. Over a thousand species of vascular plant are found on the islands, the majority of which were introduced. Of the 165 native species, 15 are endemic. 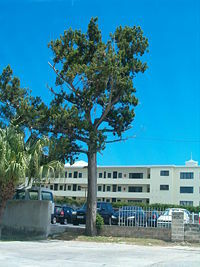 At the time of the first human settlement, Bermuda was dominated by forests of Bermuda cedar (Juniperus bermudiana). By the 1830s, the shipbuilding industry had denuded the landscape, but the forest was able to recover. In the 1940s the cedar forests were devastated by introduced scale insects, which killed roughly eight million trees. Replanting using resistant trees has taken place since then, but the area covered by cedar is still only 10 percent of what it formerly was. Another important component of the original forest was Bermuda palmetto (Sabal bermudana), a small palm tree that now only grows in a few small patches, notably at Paget Marsh. There are remnant patches of mangrove swamp around the coast and at some inland sites. Bermuda has four endemic ferns: Bermuda maidenhair fern (Adiantum bellum), Bermuda shield fern (Goniopteris bermudiana), Bermuda cave fern (Ctenitis sloanei) and Governor Laffan's fern (Diplazium laffanianum). 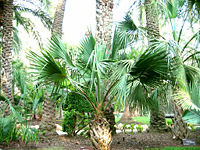 The latter is extinct in the wild but is grown at Bermuda Botanical Gardens. The endemic flora of the island also includes two mosses, ten lichens, and 40 fungi. Bermuda has no native land mammals but four species of migratory North American bats visit occasionally: the Hoary Bat, Eastern Red Bat, Seminole Bat, and Silver-haired Bat. Mice and rats have been introduced, and feral cats are common. The only native reptile is the endangered Bermuda Skink, or Rock Lizard, (Eumeces longirostris). Three species of anole lizard and two terrapins have been introduced. There are no native amphibians but two species of whistling frog and the Cane Toad have been introduced. All three are declining. A Bermuda Petrel or Cahow. Over 360 species of bird have been recorded on Bermuda. The majority of these are migrants or vagrants from North America or elsewhere. Only 24 species breed; 13 of these are thought to be native. There is one endemic species, the Bermuda Petrel or Cahow (Pterodroma cahow). There is also an endemic subspecies, the Bermuda White-eyed Vireo. The national bird of Bermuda is the White-tailed Tropicbird or Longtail, which is a summer migrant to Bermuda, its most northerly breeding site in the world. Other native birds include the Eastern Bluebird, Grey Catbird, and perhaps the Common Ground-Dove. The Common Moorhen is the most common native waterbird. Small numbers of Common Tern nest around the coast. The Barn Owl and Mourning Dove colonized the island during the twentieth century and the Green Heron has recently begun to breed. Of the introduced birds, the European Starling, House Sparrow, Great Kiskadee, Rock Dove and American Crow are all very numerous and considered to be pests. Other introduced species include the Mallard, Northern Cardinal, European Goldfinch, and small numbers of Orange-cheeked and Common Waxbills. The Yellow-crowned Night Heron was introduced in the 1970s to replace the extinct native heron. Fossil remains of a variety of species have been found on the island including a crane, an owl, and the Short-tailed Albatross. Some of these became extinct as the islands' landmass shrank, while others were exterminated by early settlers. 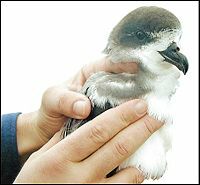 The Bermuda Petrel was thought to be extinct until its rediscovery in 1951. Among the many non-breeding migrants are a variety of shorebirds, herons, and ducks. In spring many shearwaters can be seen of the South Shore. Over 30 species of New World warbler are seen each year with the Yellow-rumped Warbler being the most abundant. The arrival of many species is dependent on weather conditions, with low-pressure systems moving across from North America bringing many birds. More than 1,100 kinds of insects and spiders are found on Bermuda, including 41 endemic insects and a possibly endemic spider. Eighteen species of butterfly have been seen; about six of these breed, including the large Monarch butterfly and the very common Bermuda buckeye (Junonia coenia bergi). More than 200 moths have been recorded. Bermuda has lost a number of its endemic invertebrates, including the Bermuda cicada, which became extinct when the cedar forests disappeared. Bermuda lies on the western edge of the Sargasso Sea, an area with high salinity and temperature and few currents. Large quantities of seaweed are present and there are high concentrations of plankton, but the area is less attractive to commercial fish species and seabirds. Greater diversity is present in the coral reefs that surround the island. A variety of whales, dolphins, and porpoises have been recorded in the waters around Bermuda. The most common is the Humpback Whale, which passes the islands in April and May during its northward migration. John Smith wrote one of the first Histories of Bermuda (in concert with Virginia and New England). Bermuda was discovered by the early 1500s, probably in 1503, according to some sources. 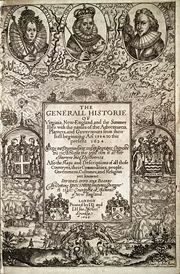 It was certainly known by 1511, when Peter Martyr d'Anghiera published his Legatio Babylonica, which mentioned Bermuda, and the island was also included on Spanish charts of this year. The discovery is attributed to a Spanish explorer, Juan de Bermudez. Both Spanish and Portuguese ships used the islands as a replenishment spot for fresh meat and water, but legends of spirits and devils, now thought to have stemmed only from the callings of raucous birds (most likely the Bermuda Petrel, or Cahow), and of perpetual, storm-wracked conditions (most early visitors arrived under such conditions), kept them from attempting any permanent settlement on the "Isle of Devils." Bermudez and Gonzalo Fernandez de Oviedo ventured to Bermuda in 1514 or 1515 with the intention to drop off a breeding stock of hogs on the island as a future stock of fresh meat for passing ships. Inclement weather prevented them from landing, however. Some years later, a Portuguese ship on the way home from San Domingo wedged itself between two rocks on the reef. The crew tried to salvage as much as they could and spent the next four months building a new hull from Bermuda cedar to return to their initial departure point. One of these stranded sailors is most likely the person who carved the initials "R" and "P" and "1543" into Spanish Rock. The initials probably stood for "Rex Portugaline" and later were incorrectly attributed to the Spanish, leading to the misnaming of this rocky outcrop of Bermuda. For the next century, the island is believed to have been visited frequently but not permanently settled. The first two British colonies in Virginia had failed, and a more determined effort was initiated by King James I of England and VI of Scotland, who granted a Royal Charter to The Virginia Company. In 1609, a flotilla of ships left England under the Company's admiral, Sir George Somers, to relieve the colony of Jamestown, settled two years before. Somers had previous experience sailing with both Sir Francis Drake and Sir Walter Raleigh. The flotilla was broken up by a storm, and the flagship, the Sea Venture, was wrecked off Bermuda (as depicted on the territory's Coat of Arms), leaving the survivors in possession of a new territory. (William Shakespeare's play The Tempest is thought to have been inspired by William Strachey's account of this shipwreck.) The island was claimed for the English Crown, and the charter of the Virginia Company was extended to include it. In 1615, the colony was passed to a new company, the Somers Isles Company (The Somers Isles remains an official name for the Colony), formed by the same shareholders. The close ties with Virginia were commemorated even after Bermuda's separation by reference to the archipelago in many Virginian place names, such as Bermuda City, and Bermuda Hundred. The first British [[coin[[s in America were struck here. Most of the survivors of the Sea Venture had moved on to Jamestown in 1610 aboard two Bermuda-built ships. Among these was John Rolfe, who left a wife and child buried in Bermuda but in Jamestown would marry Pocahontas, a daughter of Powhatan. Rolfe was also single-handedly responsible for beginning Virginia's tobacco industry (the economic basis of the Colony had been intended to be lumber). 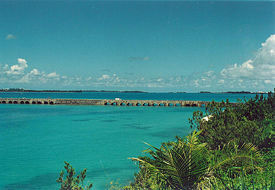 Intentional settlement of Bermuda began with the arrival of the Plough, in 1612. With its limited land area, Bermuda has had difficulty ever since with population growth. In the first two centuries of settlement, it relied on steady emigration to keep the population manageable. Before the American Revolution, more than ten thousand Bermudians emigrated, primarily to the American South, where England was displacing Spain as the dominant European imperial power. A steady trickle of outward migration continued as, by the end of the eighteenth century, seafaring was the only real industry; at least a third of the island's manpower was at sea at any one time. In the seventeenth century, however, the Somers Isles Company suppressed shipbuilding as it needed Bermudians to farm if it were to generate income from the land. Agricultural production met with only limited success, however. The Bermuda cedar boxes used to ship tobacco to England were reportedly worth more than their contents. The colony of Virginia far surpassed Bermuda in both quality and quantity of tobacco produced. After the dissolution of the Somers Isle Company, Bermudians rapidly abandoned agriculture for shipbuilding, replanting farmland with the native juniper (also called Bermuda cedar) trees that grew thickly over the whole island. Establishing effective control over the Turks Islands, Bermudians deforested their landscape to begin the salt trade that would become the world's largest and remain the cornerstone of Bermuda's economy for the next century. Beach at Astwood Park. Image courtesy of Ministry of Tourism & Transport. Bermudian sailors would turn their hands to far more trades than supplying salt, however. Whaling, privateering, and the merchant trade were all pursued vigorously. The Bermuda sloop became highly regarded for its speed and maneuverability. Indeed, at the end of the Battle of Trafalgar, the Bermuda sloop HMS Pickle, one of the fastest vessels in the Royal Navy, raced back to England with news of the victory and the death of Admiral Lord Nelson. After the American Revolution, the Royal Navy began improving the harbors and built the large dockyard on Ireland Island, in the west of the chain, as its principal naval base guarding the western Atlantic Ocean shipping lanes. As a result of Bermuda's proximity to the southeastern U.S. coast, it was regularly used by Confederate blockade runners during the American Civil War to evade Union naval vessels and bring desperately needed war goods to the South from England. In the early twentieth century, as modern transport and communication systems developed, Bermuda became a popular destination for wealthy American, Canadian, and British tourists. In addition, the Smoot-Hawley Tariff Act enacted by the United States against its trading partners in 1930 cut off Bermuda's once-thriving agricultural export trade – primarily fresh vegetables– spurring the overseas territory to develop its tourist industry, which is second after international business in terms of economic importance to the island. Executive authority in Bermuda is invested in the Queen and is exercised on her behalf by the governor. The governor is appointed by the Queen on the advice of the British government. Defense and foreign affairs remain the responsibility of the United Kingdom, which also retains responsibility to ensure good government. It must approve any changes to the constitution of Bermuda. The constitution of Bermuda came into force on June 11, 1967 and was amended in 1989 and 2003. The head of government is the premier. A cabinet is nominated by the premier and appointed officially by the governor. The legislative branch consists of a bicameral parliament modeled on the Westminster system. The Senate is the upper house consisting of eleven members appointed by the governor on the advice of the premier and the leader of the opposition. The House of Assembly, or lower house, has 36 members elected by the eligible voting populace in secret ballot to represent geographically defined precincts. Elections must be held at no more than five-year intervals. Following his victory over former Premier Alex Scott at the Progressive Labour Party delegates' conference in October 2006, the current premier is Ewart Brown. The United Bermuda Party serves in opposition. The Progressive Labour Party leadership favors independence from the United Kingdom, although polls have indicated that this is not supported by the population. 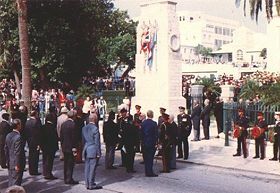 While a referendum in 1995 on independence was defeated by a substantial margin, the Bermuda Industrial Union and the Progressive Labour Party (then in the Opposition) had called for a boycott of the referendum, having an unquantified impact on the result. Remembrance Day Parade, Hamilton, Bermuda. 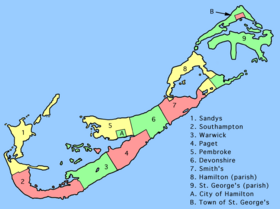 Bermuda is divided into nine parishes and two municipalities: Hamilton (City) and Saint George's (Town). Once known as the Gibraltar of the West, the defense of Bermuda remains the responsibility of the British government. Until the American Revolutionary War, following which Bermuda became the Royal Navy's Western Atlantic headquarters, the Bermuda government had maintained militia for the defense of the colony. Once the Royal Navy established a base and dockyard defended by regular soldiers, however, these militias became superfluous and were disbanded following the War of 1812. At the end of the nineteenth century, the colony did raise volunteer units to form a reserve for the military garrison. Due to its strategic location in the North Atlantic Ocean, Bermuda was vital to the Allies' war effort during both world wars of the twentieth century, serving as a marshaling point for trans-Atlantic convoys, as well as a naval and air base (during World War II). In May 1940, the United States requested base rights in Bermuda from the United Kingdom, but British Prime Minister Winston Churchill was initially unwilling to accede to the American request without getting something in return. In September 1940, as part of the Destroyers for Bases Agreement, the United Kingdom granted the U.S. base rights in Bermuda. Construction began in 1941 of two airbases, largely reclaimed from the sea. For many years, Bermuda's bases were used by U.S. Air Force and, later, Navy planes patrolling the Atlantic for enemy submarines, first German and, later, Soviet. U.S. forces withdrew in 1995, as part of the wave of base closures following the end of the Cold War. In the 1950s, after the end of World War II, the Royal Naval dockyard and the military garrison were closed. A small supply base continued to operate within the dockyard area until it, too, was closed in 1995, along with the American and Canadian bases. In both World War I and World War II, Bermudians served in British military forces. Today, the only military unit remaining in Bermuda is the Bermuda Regiment, an amalgam of the voluntary units originally formed toward the end of the nineteenth century. As an overseas territory of the United Kingdom, Bermuda has no seat in the United Nations and is represented by the UK in foreign affairs. Bermuda's close proximity to the United States has made it the site of past summit conferences between British prime ministers and U.S. presidents. The first summit was held in December 1953, at the insistence of Prime Minister Winston Churchill to discuss relations with the Soviet Union during the Cold War. Participants at the conference included Churchill, U.S. President Dwight D. Eisenhower, and French Premier Joseph Laniel. In 1957, a second summit conference was held, this time Harold Macmillan was the British prime minister and he arrived earlier than President Eisenhower to make it clear that they were meeting on British territory, as tensions were still high regarding the conflict over the Suez Canal the previous year. It was said the two discussed the general situation of the world. Macmillan would return in 1961 for the third summit with Pres. John F. Kennedy, who was familiar with Bermuda, having made numerous personal visits. The meeting was called to discuss the Cold War tensions arising from construction of the Berlin Wall. The most recent summit conference in Bermuda between the two powers occurred in 1971, when British Prime Minister Sir Edward Heath met U.S. President Richard Nixon. South shore of Bermuda (Sinky Bay). Photo by James G. Howes, July 30, 2003. Horse Shoe Bay in Southampton, Bermuda. Photo by James G. Howes, July 30, 2003. Bermuda's currency is the Bermuda dollar, which is pegged to the U.S. dollar. U.S. notes and coins are used interchangeably with Bermudian notes and coins within the islands for most practical purposes, however banks levy a small exchange rate for the purchase of U.S. dollars with Bermudian dollars. Bermudian notes carry the image of Queen Elizabeth II. The Bermuda Monetary Authority is the issuing authority for all banknotes and coins, as well as being responsible for the regulation of financial institutions. As the offshore domicile of many foreign companies, Bermuda has a highly developed international business economy; it is a financial exporter in insurance and other financial services. Bermuda's per-capita income is approximately 50 percent higher than that of the United States; according to the Bermuda government's Economic Statistics Division, Bermuda's GDP was $4.857 billion in 2005, or $76,403 per-capita, giving Bermuda the highest GDP per capita in the world. The affordability of housing has become a prominent issue over the past few years. The average cost of a house in June 2003 had risen to $976,000, making Bermuda one of the most expensive (and exclusive) places in the world to live. Bermuda is regarded as a premier offshore business jurisdiction, with low direct taxation on personal or corporate income. The local tax system is based upon import duties, payroll taxes and consumption taxes. The legal system prevailing is derived from that of the United Kingdom, with recourse to English courts of final appeal. This is regarded as advantageous by many international trading entities and banks. Saint David's Lighthouse, still in daily use. The Bermuda Stock Exchange (BSX), first established in 1971, is now the world’s leading fully electronic offshore securities market, with a current market capitalization (excluding mutual funds) in excess of US$330 billion. There are four hundred securities listed on the BSX of which almost 300 are offshore funds and alternative investment structures. The success of the BSX lies in its innovative approach to new products and markets and its ability to offer a ‘commercially sensible’ regulatory environment. The Exchange specializes in listing and trading of capital market instruments such as equities, debt issues, funds (including Hedge Fund structures) and depository receipt programs. The BSX is a full member of the World Federation of Exchanges (WFE) and is located in an OECD member nation. In recent developments, the BSX was granted Approved Stock Exchange status under Australia’s Foreign Investment Fund (FIF) taxation rules and effective September 1, 2005, was granted Designated Investment Exchange status by the UK’s Financial Services Authority. Such are the numbers of leading international insurance companies based in Bermuda that the territory is one of the world's largest reinsurance centers. Those internationally owned and operated businesses that are physically based in Bermuda – of which there are around 400 – are represented by the Association of Bermuda International Companies (ABIC). In total, over 1,500 exempted or international companies are currently registered with the Registrar of Companies in Bermuda. Tourism is Bermuda's second largest industry, with the island attracting over half a million visitors annually, of whom more than 80 percent are from the United States. Other significant sources of visitors are Canada and the United Kingdom. Tourists arrive either by cruise ship or by air at Bermuda International Airport, the only airport on the island. 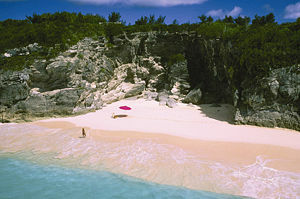 Renowned for its pink sand beaches and natural beauty, Bermuda offers a number of other attractions, as well. Historic Saint Georges is a designated World Heritage Site. Scuba divers can explore numerous wrecks and coral reefs in relatively shallow water (typically 30-40 foot depths) with virtually unlimited visibility. Many nearby reefs are readily accessible from shore by snorkelers, especially at Church Bay. Bermuda's most popular visitor attraction is the Royal Navy Dockyard and Museum. Other attractions include the Aquarium and Zoo, Bermuda Underwater Exploration Institute, the Botanical Gardens, lighthouses, and the Crystal Caves with its impressive stalactites and underground saltwater pools. 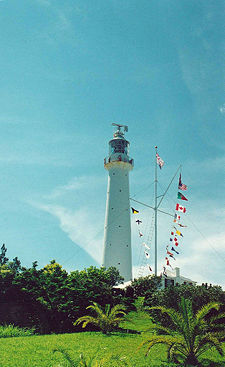 Gibbs Hill Lighthouse. Photo by James G. Howes, July 30, 2003. Bermuda's culture is a mixture of the various sources of its population, though little trace remains of the various Native American, Spanish-Caribbean, African, Irish, or Scots cultures that would have been evident in the seventeenth century, with Anglo-Saxon culture becoming dominant. The only language other than English that is spoken by any substantial part of the population is Portuguese, following 160 years of immigration from Portuguese Atlantic islands (primarily the Azores, though also from Madeira and the Cape Verde Islands). There are strong British influences, together with Afro-Caribbean. A second wave of immigration from the West Indies has been sustained throughout the twentieth century. Unlike the Africans who immigrated from that area as indentured servants (or who were imported as slaves) in the seventeenth century, the more recent arrivals have mostly come from English-speaking countries (though most of the West Indian islands whose populations now speak English were then part of the Spanish Empire). This new infusion of West Indians has both accelerated social and political change and diversified Bermuda's culture. West Indian musicians introduced calypso music when Bermuda's tourist industry was expanded with the increase of visitors brought by post-Second World War aviation. While calypso music appealed more to the visitors than to the locals, Reggae has been embraced since the 1970s with the influx of Jamaican immigration. Bermuda's literary history was largely limited to non-Bermudian writers commenting on the island. In the twentieth century, a large number of books were written and published locally, though few were aimed at a wider market than Bermuda (most of these being scholarly reference books, rather than creative writing). The first (and undoubtedly the most important, historically) notable book credited to a Bermudian was the History of Mary Prince, a slave narrative by a Bermudian woman, Mary Prince, (published 1831) which helped to end slavery in the British Empire. Bermuda's proximity to the United States means that many aspects of U.S. culture are reflected or incorporated into Bermudian culture. Dance and music are important in Bermuda. The dances of the colorful Gombey Dancers, seen at many events, were influenced by imported Native American and African slaves. 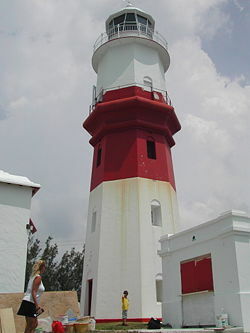 Every year Bermuda hosts an International Film Festival, which shows many independent films. Bermuda watercolors painted by local artists are sold at various galleries and elaborately hand-carved cedar sculptures are another specialty. Alfred Birdsey was one of the more famous and talented watercolorists; his impressionistic landscapes of Hamilton, Saint Georges, and the surrounding sailboats, homes, and bays of Bermuda are world renowned. He also painted some sailboat artwork that was used to promote the America's Cup when it is sailed from Newport, Rhode Island, to Bermuda. Sport is a popular pastime in Bermuda, especially sailing, cricket, golf, and football (soccer). Bermuda's national cricket team participated in the Cricket World Cup 2007 in the West Indies. The annual "Cup Match" cricket tournament between rival parishes St. George's in the east and Somerset in the west is the occasion for a popular national holiday. Warwick Long Bay. Photo by James G. Howes, July 30, 2003. 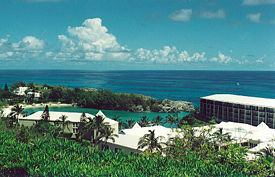 In 2007 Bermuda hosted the 25th PGA Grand Slam of Golf at the Mid Ocean Club in Tucker's Town. This season-ending tournament is only comprised of four golfers: the winners of the Masters, U.S. Open, British Open, and PGA Championship. The government recently announced substantial financial support will be provided to Bermuda's cricket and football teams. Bermuda's famous footballers include Clyde Best and Shaun Goater. In 2006, the Bermuda Hogges were formed as the nation's first professional football team to raise the standard of play for the Bermuda national football team. The team plays in the United Soccer Leagues Second Division. Sailing, fishing, and equestrian sports are popular with both residents and visitors. The prestigious Newport–Bermuda Yacht Race is a more than 100-year-old tradition. In 2007, the sixteenth biennial Marion-Bermuda yacht race occurred. A sport unique to Bermuda is racing the Bermuda Fitted Dinghy. International One Design racing also originated in Bermuda. At the 2004 Summer Olympics, Bermuda competed in sailing and equestrian events. Bermuda has had one Olympic medalist, Clarence Hill, who won a bronze medal in boxing. Bermuda also recently competed in Men's Skeleton (head first luge) at the 2006 Winter Olympics in Torino, Italy. Patrick Singleton placed an impressive 19th in the world. The Causeway. Photo by James G. Howes, July 30, 2003. In Bermuda, 54.8 percent of the population is black, 34.1 percent white, and 6.4 percent multiracial. The islands have a small but growing Asian community. A significant segment of the population is of Portuguese heritage (10 percent), the result of immigration from Portuguese-held islands (especially the Azores) during the past 160 years. Some islanders, especially in Saint David's, trace their ancestry to Native Americans, such as Algonquian peoples who were exiled from the New England colonies or sold into slavery in the seventeenth century, notably in the aftermaths of the Pequot War, and King Philip's War. Several thousand expatriate workers, principally from the United Kingdom, Canada, the West Indies, and the United States, also reside in Bermuda, primarily engaged in specialized professions such as accounting, finance, and insurance. Others are employed in various service trades, such as hotels, restaurants, construction, and landscaping services. Of the total workforce of 38,947 persons in 2005, Government employment figures state that 11,223 (29 percent) are non-Bermudians. ↑ Central Intelligence Agency (2009). Bermuda. The World Factbook. Retrieved January 23, 2012. 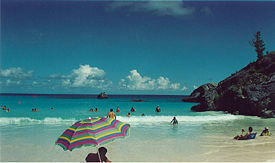 ↑ 2.0 2.1 2.2 Bermuda leads in GDP per capita, The Royal Gazette, Dec 17, 2008. Retrieved January 23, 2012. ↑ Bermuda International One Design Fleet. Bermuda International One Design Fleet Retrieved December 20, 2007. All links retrieved December 15, 2016. Bermuda Maritime Museum, a maritime museum housed in the historic Dockyard, dedicated to public education and historical, archaeological and heritage research. Bermuda National Trust, a body dedicated to the preservation of historic and environmental sites of interest, including several museums. The Royal Gazette, a daily newspaper, published since 1828. This page was last modified on 15 December 2016, at 16:03.